Barcelona's location on the shores of the Mediterranean means that it enjoys a warm, welcoming climate and pleasant temperatures all year round. Between the Barceloneta district and the River Besos, the city has over four kilometres of perfectly equipped beaches which are frequented by its residents during most of the years. Barcelona also has an olympic harbour which provides excellent conditions for water sports. 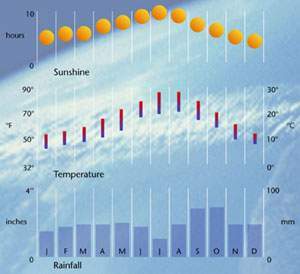 Rainfall is often heavy, with levels of around 1,000mm per year. This helps to maintain the many green areas around the city. In any season of the year, Barcelona basks in the sun. You can eat in open-air restaurants or have a drink on the terraces, by the shores of the Mediterranean sea.